When you get sick with any illness you need a list of treatments with Treatment Scores. The Treatment Score = the net treatment benefit for the patient. The Treatment Score is calculated using EBM guidelines and shared decision-making. Treatment Scores solve health illiteracy while taking into account the values and preferences of individual patients. DISCLAIMER: Always see your own licensed medical physician for diagnosis and treatment. 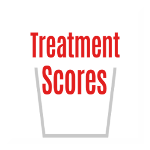 Treatment Scores are an organizational tool only.